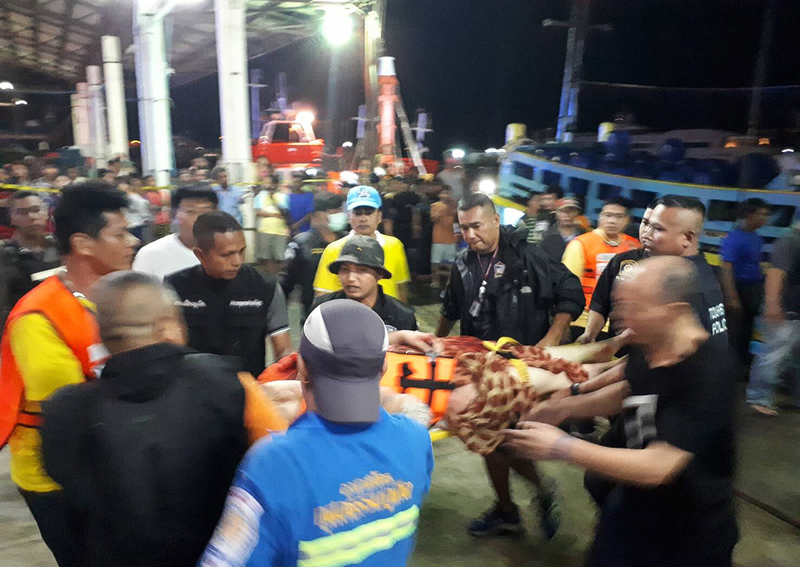 At Least 27 Dead After Tourist Boat Overturns Off Thailand The boat was carrying more than 100 passengers, mostly Chinese. The Thai navy said another 29 people are still missing after the vessel capsized in rough weather off the resort island of Phuket. Phuket Gov. Norraphat Plodthong said 51 people had been rescued, according to The Phuket News. Later, Thai navy Rear Adm. Chareonpol Kumrasee told Reuters that "quite a lot of bodies" were found by divers inside the vessel's submerged hull. He said at least 27 were dead and 29 more were missing. Strong winds continued to blow as rescue workers searched for survivors in the Andaman Sea off the popular island destination of Phuket, the newspaper reports. Reuters said 93 of the passengers on the boat, called the Phoenix, were Chinese tourists. Somjing Boontham, the captain of the Phoenix, was quoted in Thai media as saying his vessel was hit by a 13- to 16-foot wave, according to The Nation newspaper. "Seawater flooded inside the vessel. The water pump was not fast enough to pump the water out and the boat began to lean," he said. "I asked all passengers to check that their life jackets were secure. Two life rafts were deployed while nearby fishing boats were contacted for help," the captain said, according to the newspaper. "The boat sank very quickly. We did our best to keep the passengers calm and keep them safe during the chaos."